Purchase your handgun or long gun range time here and save time. FREE Basic Handgun Cleaning available for Members. While you wait. One per month. Tues-Fri only. Restrictions apply. $10 Basic Handgun Cleaning available. While you wait. Tues-Fri only. Restrictions apply. Simply print out your receipt and bring it in, along with your driver’s license or other Gov’t photo ID. To receive ‘Member’ rates, you must present your membership card at our store. Please Note: During weekends and other busy times, we reserve the right to limit range time to 1/2 hour. If we limit your time, you will be able to return at another time to use the remainder of your time. Thank you for your understanding. All range time is first come first served. 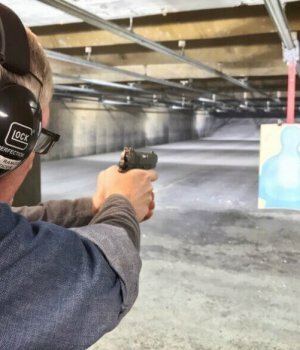 You must be at least 21 years old to use a handgun on our range and you must be at least 18 years old to use a long gun on our range. IMPORTANT NOTE: During Weekends and other Busy Periods, Range times may be limited to 1/2-Hour and there may be a wait list. IMPORTANT NOTE: MUST Show Membership Card in Store. During Weekends and other Busy Periods, Range times may be limited to 1/2-Hour and there may be a wait list. Come in. Check us out! 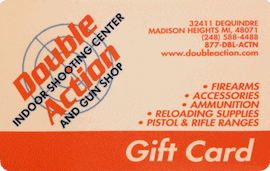 Double Action Gift Cards make awesome gifts for that someone you love and they never expire! Select to pick it up at our store or let us mail it to you or your loved one. website by wpdv design, inc.